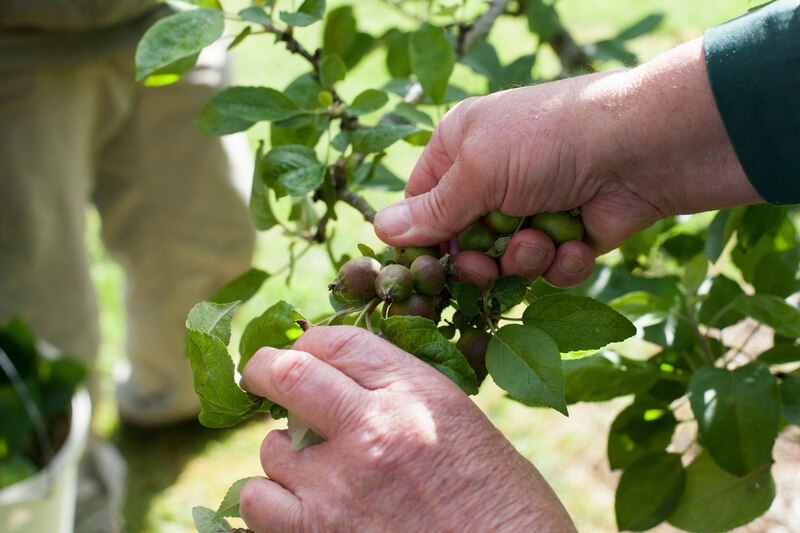 Removing excess fruit from apple and pear trees allows for a more consistent production, bigger and better fruit. It is carried out by gardeners who wish to intervene beyond the tree’s natural ways of doing it, and should be done on younger trees. 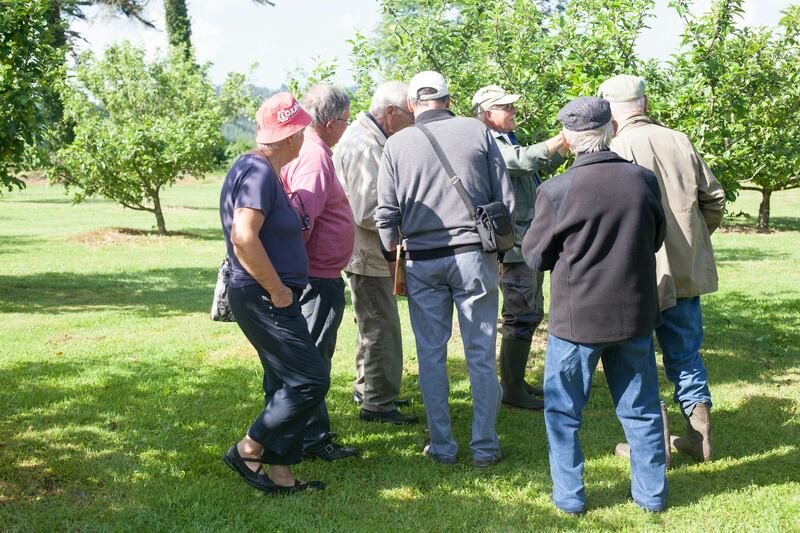 On Sunday, I attended a workshop on “thinning” organized at La Plantelière near Aurillac. The experts from “Les Croqueurs de Pommes du Cantal”, a local association dedicated to informing and educating the public about fruit trees, explained us the theory behind the practice of thinning, before showing us how to actually do it. An expert hand from “Les Croqueurs de Pommes” sharing knowhow. Photo 26 June, La Plantelière, Aurillac, France. 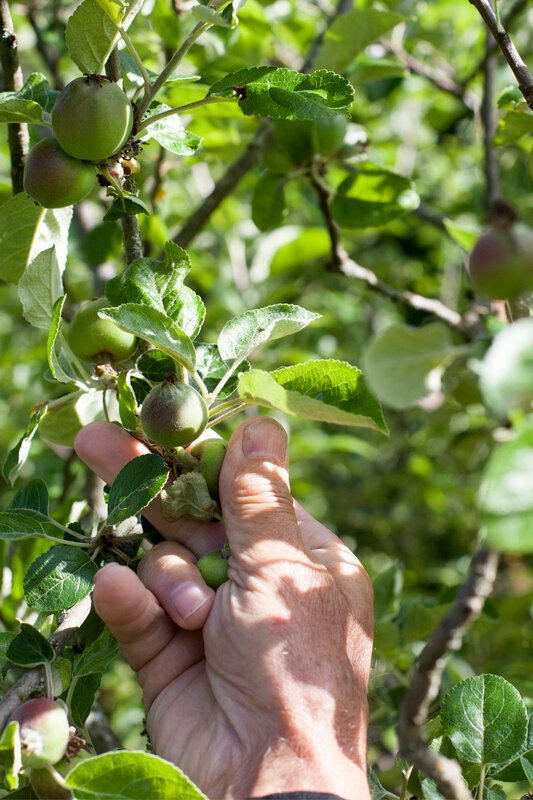 The aim of “thinning”, which means removing excess fruit from trees, is to optimize fructification. 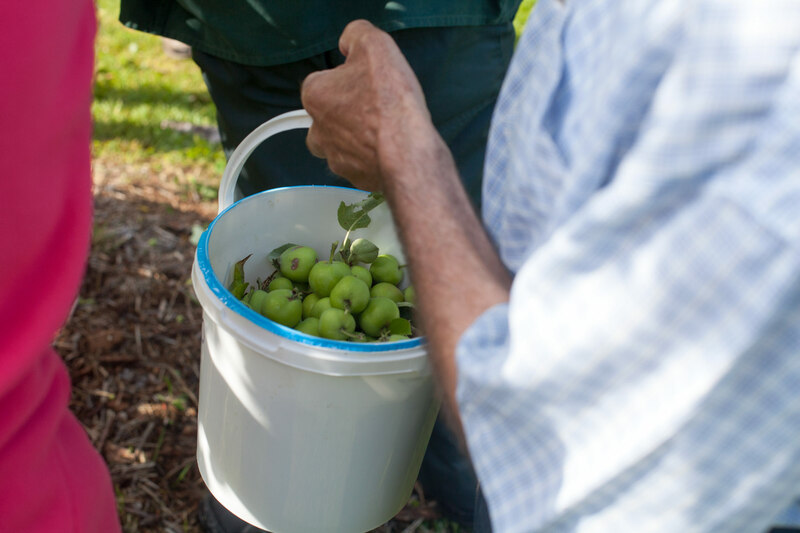 It is carried out on pome fruit such as apples and pears, on younger and more mature trees. Thinning helps the tree optimize the balance between fruit and leaves. The leaves enable the tree to nourish itself and its fruit through photosynthesis. Maintaining a good balance makes the tree stronger and it will produce better fruit. Weather conditions have a strong impact on the fructification cycle. In a year where pollination has been very good and there was no frost afterwards, the tree may produce a lot. The year after, there might not be any fruit at all, irrespective of weather conditions, because the tree needs to rest. Thinning stops the tree from getting exhausted and enables a more consistent production from one year to another. Thinning has other benefits. Removing smaller fruit enables you to get bigger apples and pears because energy is not wasted feeding the smaller ones. The tree might get rid of some of them anyway, as it has its own clearing mechanisms, but it is good to do it more systematically and earlier rather than later. A lesser known fact is that thinning allows you to get better fruit. More carbohydrates going into the apples and the pears means that they will get higher in sugars, which will give them better taste. They will be more intensely coloured too, and will keep for longer, as sugars help with preserving. This is all about optimisation really. You may prefer to let nature go its own way! However, it is important to do it for younger trees. Only leave two or three fruit on the tree you planted the year before and maybe keep only a third of the fruit you get in the following two years. It will help the tree grow and root itself more smoothly and effectively. 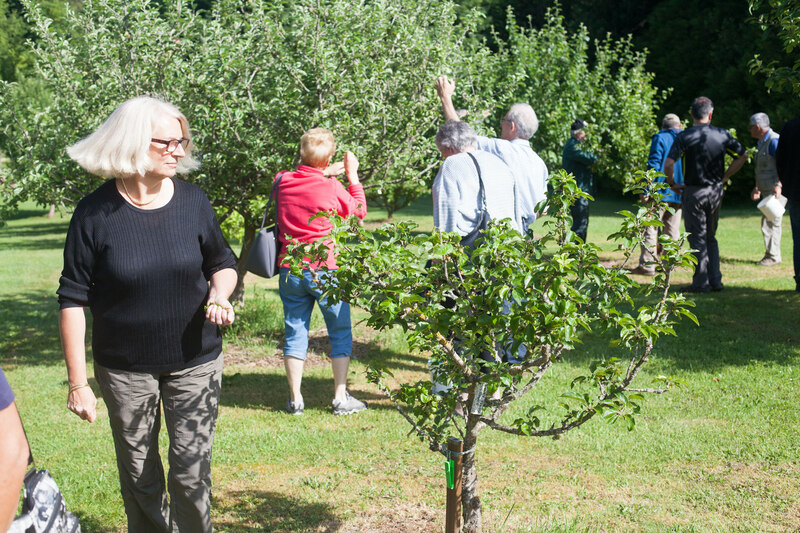 We were told that ten apples or pears per meter of tree branch is optimal on a mature tree. 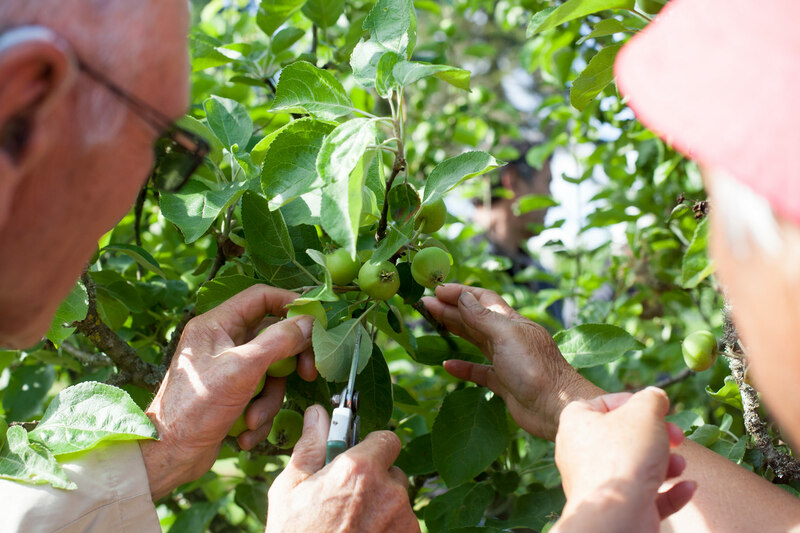 Showing how to thin apples with a prune shear. 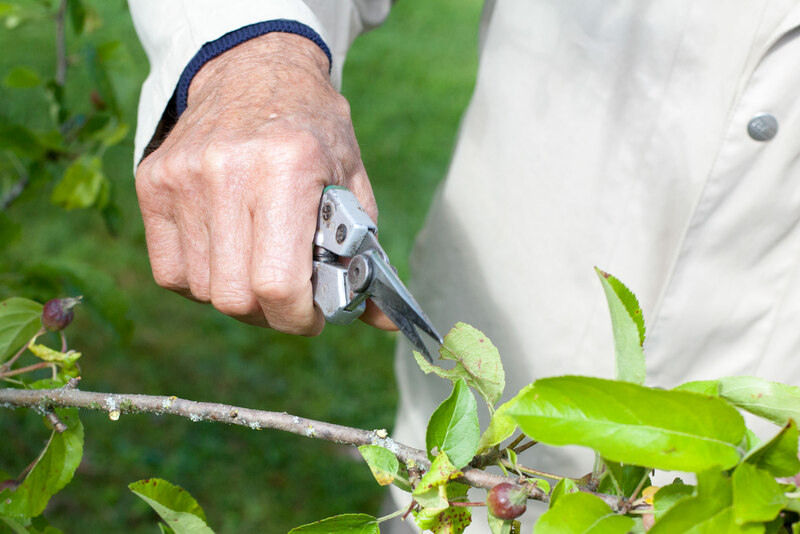 Pruning shear with straight blades, for tool lovers. Thinning by hand works just as well. Some prefer pinching the stalk with their thumbnail. … A maximum of two. 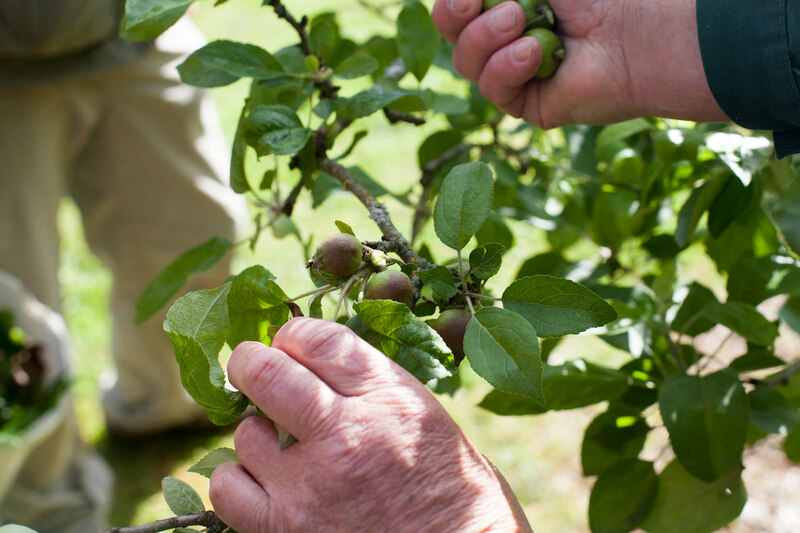 Up to 70% of the apples and pears can be removed, to stick to the ten fruit per meter of branch rule. It should be done in two or three instances, between June and August in Europe, to avoid stressing the tree. Ideally you should start when the fruit are the size of a hazelnut, so slightly smaller than these. Great to be trained by experts! 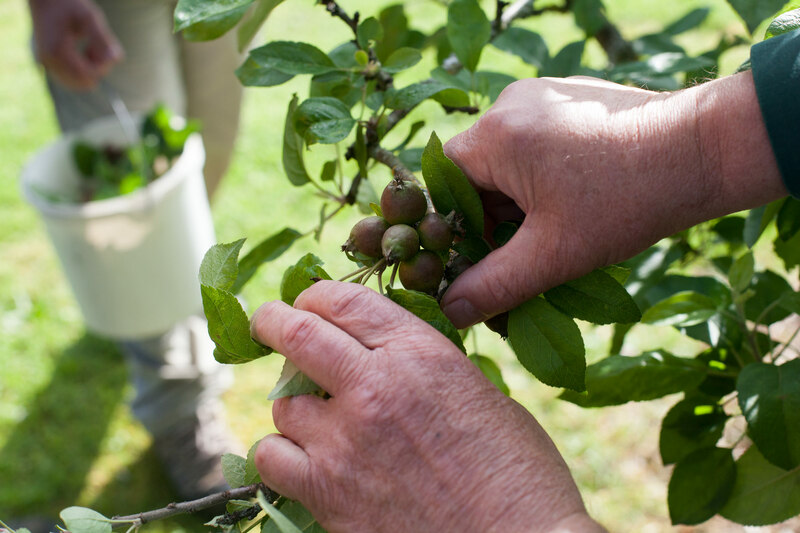 We then practised ourselves, carrying out the first thinning session of the year in La Plantelière’s orchard. Quite a pleasant day out of doors! 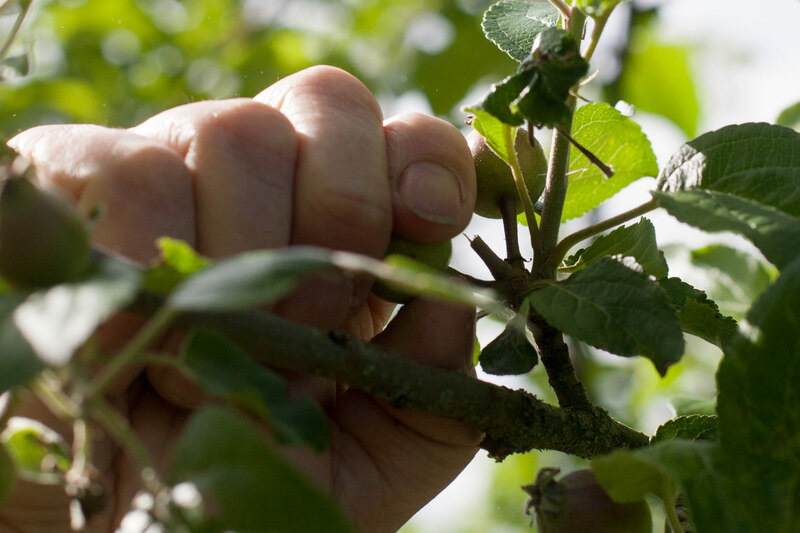 The next workshop will be about “green pruning” (or “summer pruning”) in July. This entry was posted in Grow and tagged Apples, Aurillac, CroqueursDePommes, France, Pears by Les Jardins d'ici. Bookmark the permalink. Thanks so much for this post! I’m doing an espalier with a pear tree. It’s only a couple years old, so no need to fret about overproduction yet, but when (if) it ever does start fruiting I’ll keep this advice in mind. Thank you for reading, I am glad it is useful to you! One of the experts actually spoke about a young cordon in his garden. He had seventeen pears this year, and is keeping six of them, three on each side. Wow! I had a few flowers this year but no fruit. Fingers crossed for next year.